Shaolin Temple was established in 495A.D. at the western foot of Songshan Mountain, 13 kilometers northwest to Dengfeng City, Henan Province. The then-Emperor Xiaowen of the Northern Wei Dynasty (386-557) had the temple built to accommodate the Indian master Batuo (Buddhabhadra). 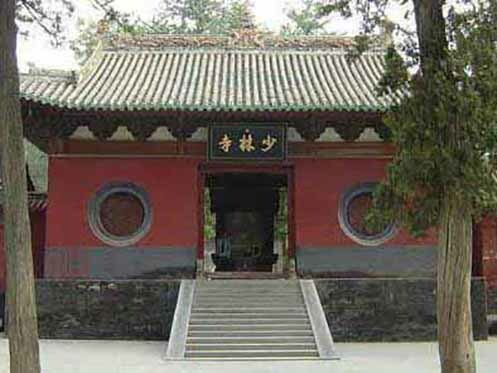 Shaolin Temple literally means “temple in the thick forests of Shaoshi Mountain”. As the first Shaolin abbot, Batuo (Buddhabhadra) devoted himself to translating Buddhist scriptures and preaching doctrines to hundreds of his followers. Later, another Indian monk Bodhidharma arrived at Shaolin Temple, who was said to have crossed the Yangtze River on a reed. He spent nine years meditating in a cave of the Wuru Peak and initiated the Chinese Chan tradition at Shaolin Temple. Thereafter, Bodhidharma was honored as the first Patriarch of Chan Buddhism. As Chinese Kungfu also originated from Shaolin Temple, it has been recognized as the origin of Chan Buddhism and the cradle of Kungfu.